Being a home inspector means you spend your days traveling between homes, snapping photos, and filling out reports. The ability to work from anywhere like your car or truck is key to a successful home inspection business. Eric knew he needed the kind of mobility that G Suite offers. RCN Technologies helped him begin his G Suite journey. 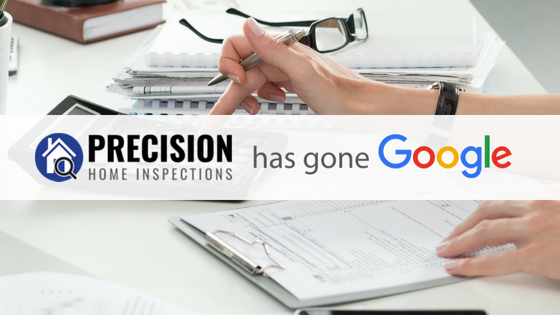 Precision Home Inspections has Gone Google! Eric no longer has to worry about syncing his phone calendar with his computer calendar. He also isn’t stressed about missing important emails while he is away from his desk anymore. His information follows him wherever he goes thanks to G Suite. The utilization of Google’s calendar for Precision Home Inspections allows Eric to check his schedule without even touching a button thanks to reminders and event notifications that go to any of the devices he chooses. He can change his events with ease even when he is on the go on his mobile device. All of his business apps are linked to his gmail account! RCN Technologies helped Eric get setup with Gmail. It’s synced with Google Drive to ensure that he has plenty of space to keep, view and respond to emails quickly. Email reminders, sufficient storage and an optimal user interface has helped Eric save time and stay organized throughout his day. Being the hard working family man that Eric is, he was having trouble keeping his personal pictures and maintaining adequate space for inspection photos. Google Drive was able to fix this issue, giving him unlimited cloud storage for all of his files. Eric can now upload pictures from anywhere without any stress. Google Docs, Sheets and Slides apps in G Suite have streamlined Eric’s business documents. These features gives him more time to focus on his family and customers. Thanks to these apps he was able to turn a 3 step download and file conversion process into 1 step at the click of a button! Now he has all of his inspection reports in one dedicated, easily accessible place. They can be converted from Docs to Microsoft Word and Sheets to Excel to share files with confidence and ease. Lastly, RCN Technologies set him up with Google Voice. Voice gives him a separate phone number of his choosing for his business line. This helps him separate work from the rest of his life. Now he never has to worry about giving out his personal number. Learn more about how Precision is using G Suite on our latest blog post. Be sure to tag someone you know who needs a better way to work!